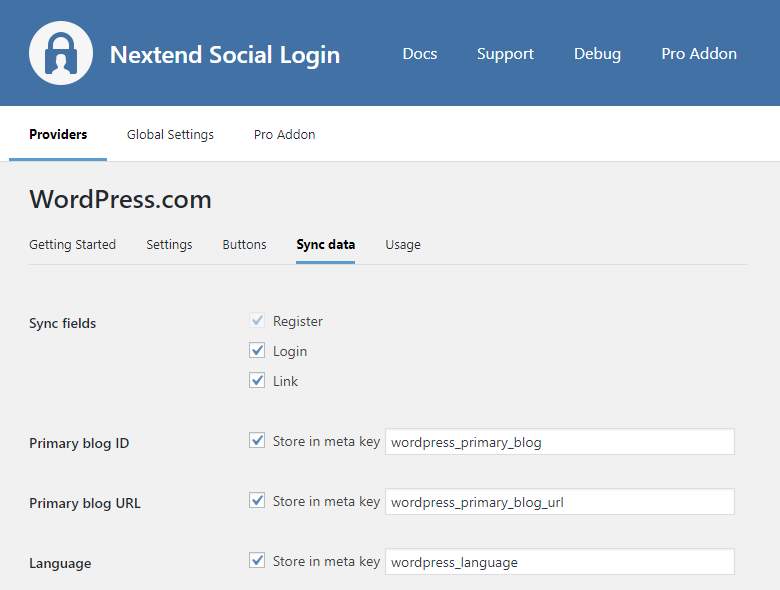 To be able to log in via WordPress.com you must create a WordPress.com app first. 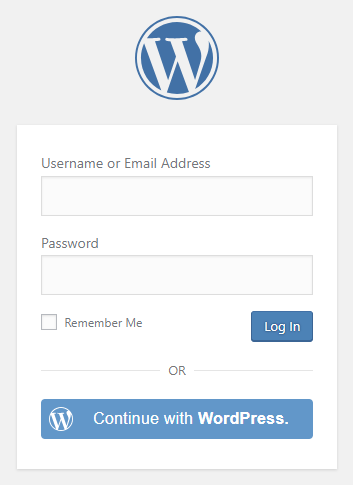 Log in with your WordPress.com credentials if you are not logged in. Click on the “Create New Application” button. Enter a “Name” and “Description” for your App. Add the following URL to the “Redirect URLs” field https://yoursite.com/wp-login.php?loginSocial=wordpress, where the yoursite.com is your domain. Complete the human verification test. At the “Type” make sure “Web” is selected! Click the name of your App either in the Breadcrumb navigation or next to Editing! Here you can see your “Client ID” and “Client Secret”. These will be needed in the plugin’s settings. Once your WordPress.com app is ready you’ll need to copy and paste the Client ID and Client Secret to the WordPress.com provider’s Settings tab. Once your Client ID and Client Secret has been added you need to verify the setup first. This verification helps you identify possible problems with the app. The Client ID of your WordPress.com app. You can find it at under your App’s OAuth Information section. The Client Secret of your WordPress.com app. You can find it at under your App’s OAuth Information section. 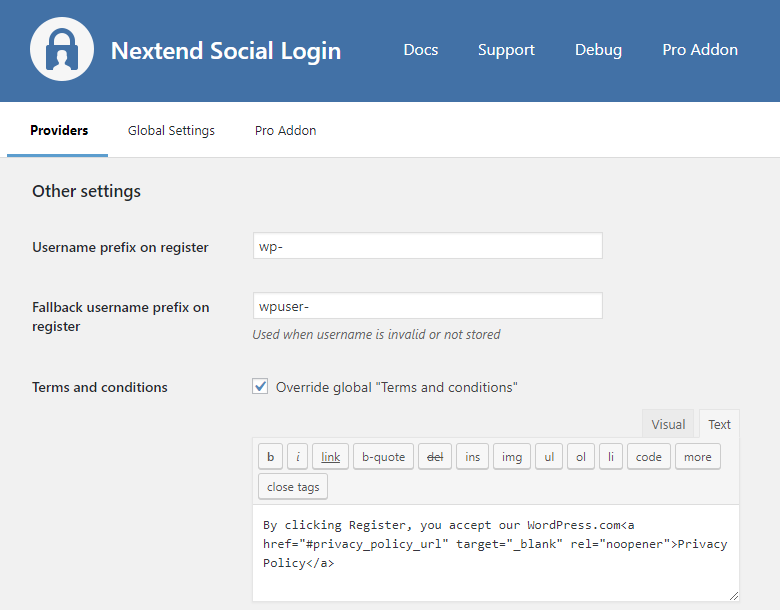 Whenever a new user registers with their WordPress.com account they can get a custom prefix so you can easily identify them. Whenever a new user registers with their WordPress.com account and we can not generate a valid username from the first name or last name, a random username will be generated. With this option they can get a custom prefix so you can easily identify them. This option can only be seen, if Terms and conditions is set to Show in Global Settings → Privacy tab. 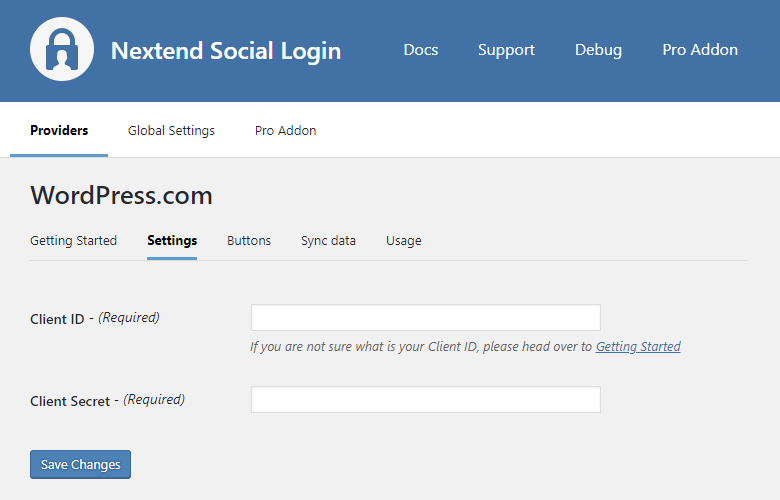 Here you can set custom Terms and Conditions for users who register with WordPress.com. For more information please read our GDPR documentation. 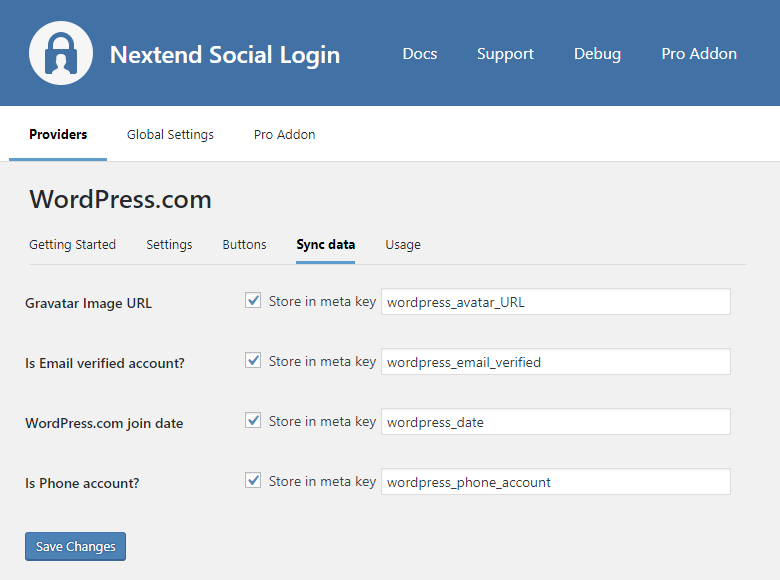 By default Nextend Social Login stores the first name, last name, email, avatar url and access token if it is possible, however some additional information can also be retrieved and stored. When an option is checked, that field will be stored in a meta key with the specified name. It determines when the synchronization shall happen. Register: whenever a new user registers with a provider, their data will be retrieved and stored. Login: whenever user logs in with a provider, their data will be retrieved and stored. Link: whenever user links and existing WordPress account with a provider, their data will be retrieved and stored. Stores ID of the user’s primary blog. Stores the URL of the user’s primary blog. Stores the user’s language setting. Stores the user’s Gravatar image URL. Stores if the user’s account has been verified (via email). Stores the date when the user joined WordPress.com. If this is a phone account then the user does not have a verified email address. Error Message: Mismatch in redirect_uri. The problem is that the entered Authorized redirect URIs field is not correct for your app. Check the 6th step of the App setup to fix the problem. The problem is that the entered Client ID field is not correct for your app or maybe the app with the entered ID was deleted. Check the 12th step of the App setup to fix the problem. The Client Secret you copied from the WordPress.com app is invalid. Make sure the correct one was copied. And receive the latest news from Nextend. Our philosophy is to create buzz in the WordPress, Joomla and Magento community with our innovative designed, lightweight, impulsive and engaging ideas. Be prepared for Next generation software!